It all started with a social media post at Christmas featuring the new mayor of Atlanta’s mac and cheese dish that drew mock ire and jokes. Not one to let a little social media pressure get the best of her, Atlanta Mayor Keisha Lance Bottoms turned the jokes about her version of the popular dish into a campaign to fight hunger in the city she presides over. The mayor’s More than Mac campaign, in partnership with Kroger, has raised more than $37,000 to benefit the Atlanta Community Food Bank. Created to support the fight against food insecurity and hunger, the campaign was developed to shed light on an issue many Atlantans face every day. Dollars donated between Jan. 31 and Feb. 16 were collected through Kroger’s Round Up at the Register initiative, where customers had the opportunity to round up their purchase to nearest dollar or donate an amount of their choosing. Donations raised benefit the Atlanta Community Food Bank which provides nearly 58 million meals for more than 755,000 people each year. 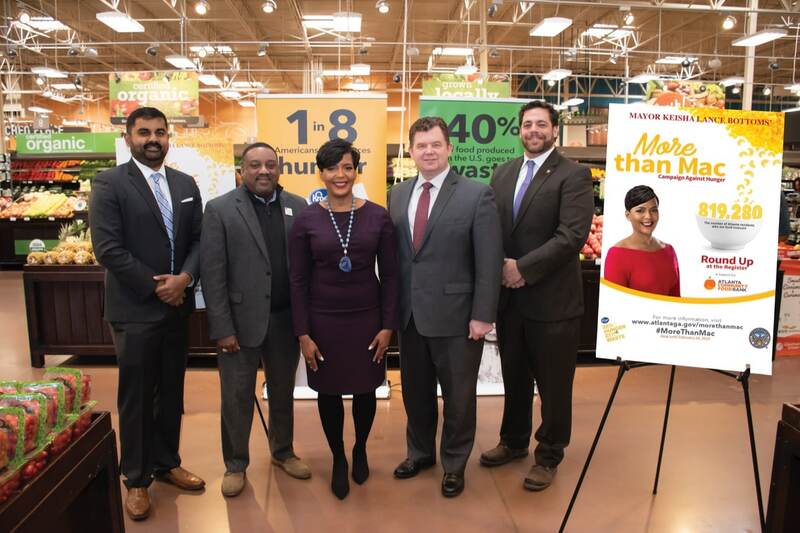 “We would like to thank our Kroger customers and associates for their overwhelming generosity and commitment to ending hunger throughout metro Atlanta – and especially for the support they showed for the More than Mac round-up with Mayor Bottoms,” says Felix Turner, Corporate Affairs Manager for Kroger’s Atlanta Division. The Atlanta Community Food Bank works with more than 600 partner nonprofit agencies in 29 counties including food pantries, shelters, community kitchens and other programs that provide resources for food insecure residents. For every $1 donated, the Food Bank can provide up to four meals. Through the More Than Mac campaign, more than 148,000 meals will be served. According to national statistics, 41.2 million people are food insecure, which equates to nearly 13 million children. Additionally, more than 15 percent of U.S. residents live below the poverty line and, working families make up a significant portion of the need in metro Atlanta. As part of Bottoms’ One Atlanta vision, the city is continuing to create new opportunities to address and eradicate food insecurity. The cornerstone of this commitment is the development of a resilient local food system to help increase access to fresh, healthy foods and reduce food deserts in Atlanta. Led by the Mayor’s Office of Resilience, this effort will also help preserve and expand Atlanta’s natural environment as the Administration continues to build an equitable and inclusive city. One such program is the city’s Grows-A-Lot program, through which gives residents the opportunity to earn a five-year license to turn vacant, city-owned land into gardens or farms. 90 percent of the sites in the pilot program are located in low-income food desert areas. To learn more about the City of Atlanta’s ongoing efforts, you can visit: www.atlantaga.gov/government/mayor-s-office/executive-offices/office-of-resilience.